Wiener works has five locations and employs approximately 60 people. These people have found that flexibility is one of the chief benefits of working at Wiener Works. We understand that our employees juggle many responsibilities and commitments. Therefore, we offer full time and part time day or night shifts, as well as flexible scheduling to accommodate school requirements. 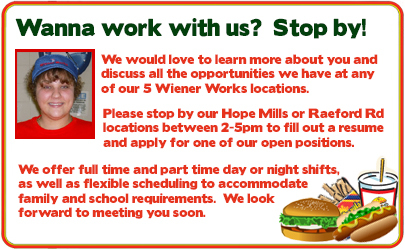 Among our five locations, Wiener Works regularly has various openings. Therefore, if you are interested in working for a locally owned restaurant chain, do not hesitate to apply at any time. Applications are available at all five stores. We prefer that employment applications be submitted between 2 - 5PM daily. For more information call 910-484-3638 and ask for Mary Tackett. Neatness and attention to detail: A neatly and fully filled out job application will go a long way toward demonstrating these characteristics. Consistency/Dependability: Consistent prior job experience is very favorable. Friendly personality: Smiles are contagious! They make customers want to come back to our stores and fellow employees want to do their best. Please apply in person between 2-5pm daily Monday through Friday for answers to your questions and to submit your resume, application, and information. If Wiener Works sounds like a place you would want to come to work, please apply soon!